Lately, I’ve found that eBay has been one of the best ways to beef up my junk box with inexpensive electronics components (eBay Stores are my preference, the auctions often aren’t that great). I purchased a nice SMD resistor/cap assortment from a company called Sure Electronics and found that they have some other goodies that might be of interest to the homebrewer. 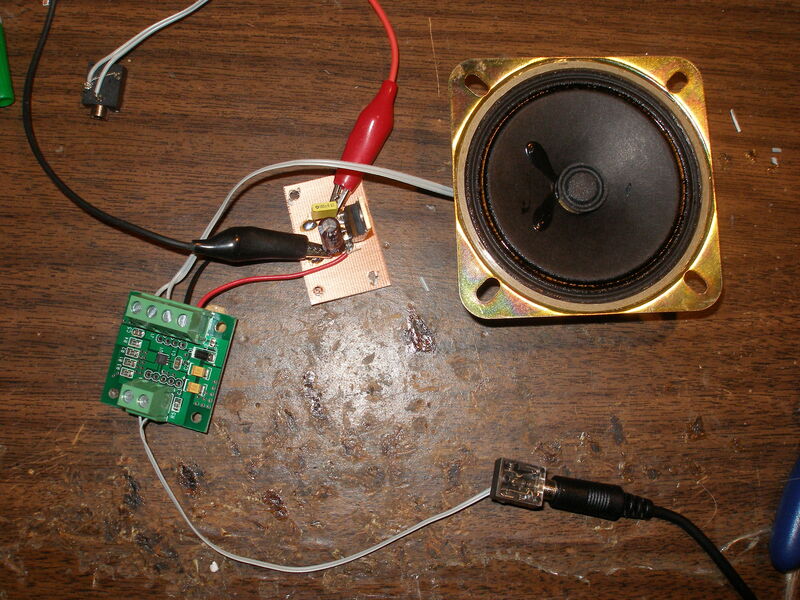 One of those is a tiny little (about 1″ x 1″) 2 watt mono audio amplifier based on the EUA2005 IC. The spec sheet states that the IC output power is 1.5 watts, so the manufacturer might be fibbing a bit on their specs. Regardless, it’s enough power to drive a 3″ speaker to a decent volume for shack listening. The IC has a maximum VCC of 6 V, so I had to create voltage regulator to step my 12 V bench supply down to 5 V using a 7805. The audio quality is definitely what I would call “communications” grade, but the price is great: $2.22 for a 2-pack. One word of warning: your order is shipped from Hong Kong, so expect about 2-3 weeks for your order to arrive. For those working on W8DIZ’s frequency counter project in QQ, they also have a Atmel STK500 in-circuit programmer clone for a very inexpensive price. I haven’t had a chance to try mine out yet, but if it works as advertised it’s well worth the price (I have no reason to believe that it won’t work, but if doesn’t, I will update this post). The usual disclaimer applies: I’m not associated with the company in any way, just a satisfied customer.